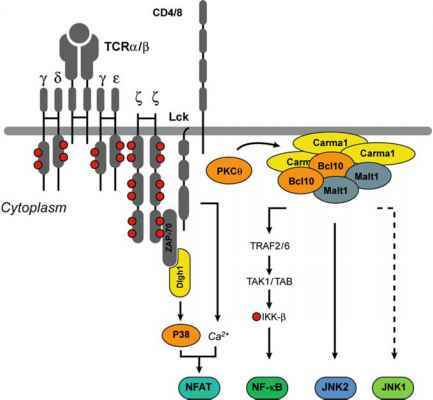 In the cAMP-dependent pathway, an extracellular signal ("first" messenger: neurotransmitter, hormone or light) activates a cell surface receptor coupled to a trimeric G-protein that, after dissociations of its three subunits, modulates the activity of adenylyl cyclases (ACs), the enzymes that synthesize cAMP. At any given time, the intracellular concentration of cAMP results from the balance between synthesis and degradation. The catabolism of cAMP is mediated by phosphodiesterases (PDEs), a superfamily of more than 90 enzymes that differ for their specific localization and regulatory mechanisms (Bender and Beavo 2006). Upon synthesis, cAMP rapidly diffuses into the cytosol to activate downstream effector proteins, i.e., the cAMP-dependent serine-threonine protein kinase A (PKA), guanine-nucleotide exchange proteins (Epacs) and cyclic nucle-otide-gated (CNG) ion channels. PKA is a tetramer consisting of two catalytic (C) subunits held in an inactive conformation by a regulatory (R) subunit dimer. R subunits comprise a dimerization/docking (DD) domain at the N-terminus, responsible for docking of R subunits to specific intracellular sites via high-affinity binding to A-kinase anchoring proteins (AKAPs), a family of multiscaffolding proteins that anchor PKA to specific intracellular locations (Wong and Scott 2004). The DD domain is followed by a flexible linker that docks to the C subunit active site in the holoenzyme and acts as an inhibitory site (IS). The inhibitory site is followed by two tandem cAMP-binding domains. The holoenzyme dissociates when cAMP binds to the R subunits, thereby releasing the active C subunits. Two PKA subtypes are known: the type-I holoenzyme contains RI subunits and is primarily soluble, whereas the type-II holoenzyme contains RII subunits and is associated with particulate subcellular fractions (Francis and Corbin 1999). Epacs are guanine nucleotide exchange factors (GEFs) for Rapl and Rap2 (de Rooij et al. 2003). Rap GTPases cycle between an inactive GDP-bound and an active GTP-bound state, with GEFs mediating the exchange of GDP for GTP. The N-terminus of Epacl proteins consists of a regulatory domain containing a cAMP-binding site similar to those present in the R subunit of PKA and, in addition, a Disheveled, Egl-10 and pleckstrin homology (DEP) domain that mediates membrane attachment (de Rooij et al. 1998; Rehmann et al. 2003). The C-terminal region consists of a catalytic domain that is characteristic of exchange factors for the Ras family of GTPases. At low cAMP levels, Epac folds into an inactive conformation, and steric hindrance prevents the binding of Rap. When cAMP binds to the protein, Epac unfolds, allowing Rap binding (Rehmann et al. 2003). CNG channels are cation channels that have been characterized in rod and cone photoreceptors and in olfactory sensory neurons of vertebrates (Finn et al. 1996). These channels are homo- or hetero-tetrameric with a core region in each subunit including six transmembrane helices. On the intracellular side, the so-called C-linker domain couples the gating transmembrane part to a cyclic nucleotide-binding domain, which has been shown to be more sensitive to cGMP than cAMP. By controlling the flux of ions through the membrane, these channels play a critical role in the regulation of the transmembrane potential and of the concentration of ionic species, such as Ca2+. As opposed to their cognate hyperpolarization-activated cyclic nucleotide-modulated (HCN) channels, which are opened by transmembrane hyperpolarization and whose activity is only modulated by cyclic nucleotides, CNG channels are poorly voltage dependent.